With the new climate report now out, will policy follow or politics intervene? The White House dismissed their findings as "extreme" and "not based on facts." The president said he didn't believe the dire economic warnings and questioned the near-consensus of climatologists that climate change is man-made. But now, more than ever, the authors of the most comprehensive report to date on the toll climate change is taking on the U.S. -- and its projected consequences -- warn against politicizing their work. "The easiest way to deflect science is to put doubt on the data that it is based on," said Paul Chinowsky, an engineering professor at the University of Colorado with a decade of experience working on climate impacts. "I can tell you this was one of the most thorough data justification exercises that I've ever been involved in, in all the years I've been working on this, and it really comes down to a question of, are you going to believe the international community and scientists and engineers involved in putting the data together, or do you just want to dismiss it?" Chinowsky said. The authors -- a combination of climate scientists, engineers, federal experts and local officials -- are acutely aware of the timeline they're working with -- both in the U.S. and globally. "The window of making emissions less is within this next decade, what we all do around the world is really going to matter," said Brenda Ekwurzel, an author of the report's section on mitigation efforts. Ekwurzel is a senior climate scientist with the Washington, D.C.-based non-partisan nonprofit called the Union of Concerned Scientists, and has worked on government reports in the past. (STOCK PHOTO/Getty Images) Chimneys and cooling tower of a coal fired power station are pictured in this undated stock photo. Ekwurzel also rejected the White House's characterization of the report as "extreme," a description employed by White House press secretary Sarah Sanders at Tuesday's press briefing and used by Republicans in Congress. 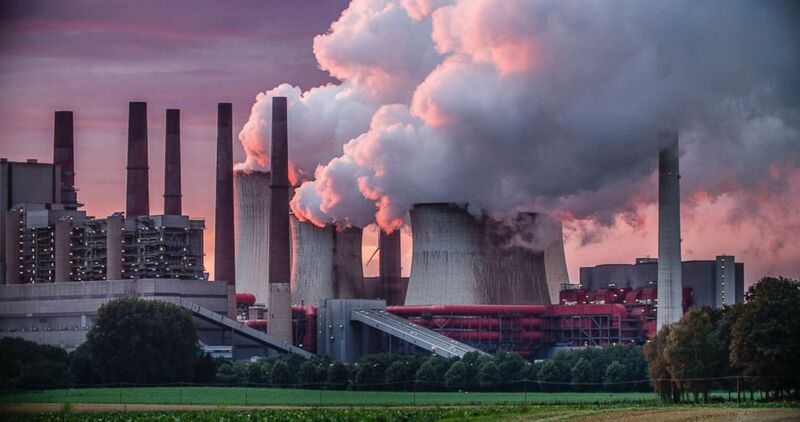 According to the report, a continued increase of greenhouse gases could lead to annual economic losses in the hundreds of billions of dollars. "It's really quite conservative if you ask me," she said. Ekwurzel pointed to the hundreds of billions of dollars damage already accounted for. In 2017, hurricane season caused more than $250 billion damage and the Tubbs Fire, then the most destructive in California's history, caused an estimated $1.2 billion in damages, according to the report. Flooding, which devastated parts of Texas after Hurricane Harvey, and wildfires, like the recent Camp Fire in California, are increasing, the report said --changes that are "clear signs of a warming world." Reporters on Monday asked Trump if he'd seen the dire economic details predicted in the report. "I don't believe it," he said on the White House lawn. 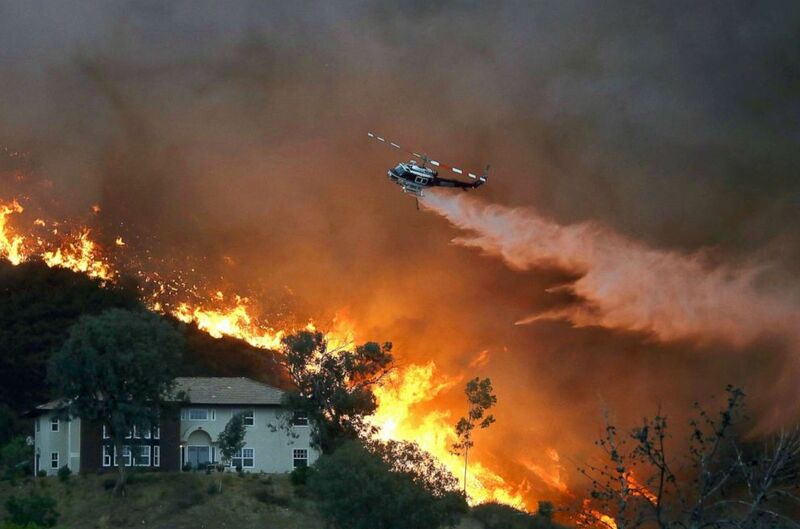 (Mario Tama/Getty Images, FILE) A firefighting helicopter makes a water drop as the Holy Fire burns near homes, Aug. 9, 2018, in Lake Elsinore, Calif.
"I think there's a disconnect for people understanding the level of climate change we’re already experiencing," said Ekwurzel, who has been studying climate change since 1990 and began her studies at the North Pole, focused on the Arctic Ocean. Authors also argued that politicizing the findings of the report will hamper the ability for policy to move forward in a particularly divided Congress -- and while communities, states and industries have full access to the information, which they can use to inform local policy decisions going forward, federal guidelines are a vital next step in protecting against detrimental effects of climate change. "I've seen over the last year, a lot more states and local cities and counties are taking it upon themselves to actually put things in place. But they're limited in what they can do and only have so much money and need federal help," said Chinowsky. Chinowsky spent two years working as a co-author on the chapter of the report that focuses on how transportation systems across the country will be affected by climate change, from bucked concrete roads to bridges washed away in floods. By design, the 4th National Climate Assessment doesn't offer policy recommendations. Instead, the 13 federal agencies and over 300 authors provide the information and leave the rest to policy makers, who they hope will put their findings into motion. 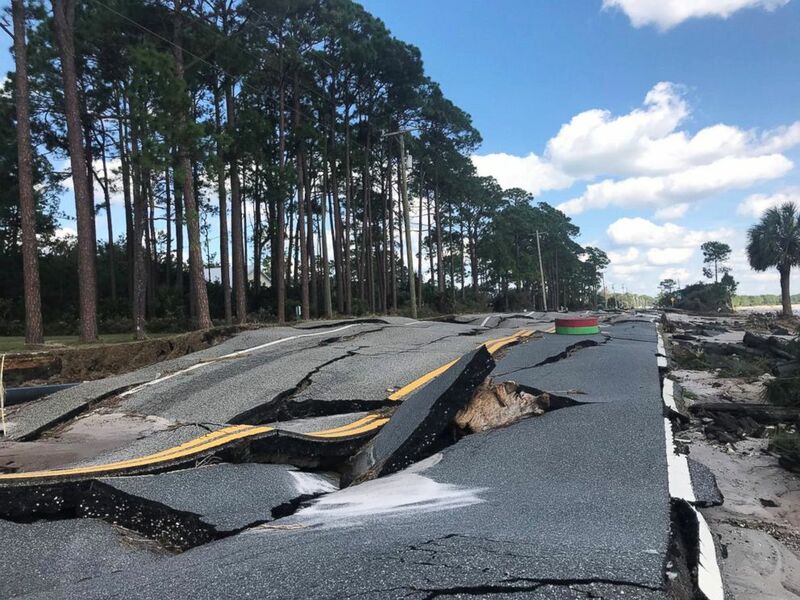 (Duke Energy via Reuters) A damaged road is pictured after Hurricane Michael blew through Carrabelle, Fla., Oct. 11, 2018. Jennifer Jacobs, the transportation chapter lead author, like Chinowsky, stressed that local communities alone can't make the difference -- the effort requires federal help. Each day, communities spend billions of dollars on infrastructure that's often intended to last for decades, putting the engineering community in a tough spot, said Jacobs, who serves as director of a network that connects climate science with engineering research. "The risk is that we’re going to develop infrastructure that’s not going to be able to handle the risks," Jacobs said. "In order to change how a road or a bridge is designed, we need to put in new guidance and new policies. You can't just have an engineer say I read a [National Climate Assessment] report and this is how it's going to be designed." The most striking finding in the transportation chapter, Jacobs said, was improvements in understanding the impact of extreme heat, which can stress bridges, cause roads to expand, lead rail tracks to bend and force airplanes to re-route because of federal aviation standards about landing in high heat. The likelihood of these issues is predicted to increase since the frequency of summer heat waves have increased and the highest extremes occurred over the last two decades, according to the 2017 Climate Science Special Report, the first volume of the 4th National Climate Assessment. Movement on climate change legislation is most likely to start in the House of Representatives. Leaders of the House Committee on Science, Space and Technology from both sides of the aisle declined to comment to ABC News on their plans for the report. (Thomas B. Shea/AFP/Getty Images, FILE) People walk through the flooded waters of Telephone Rd. 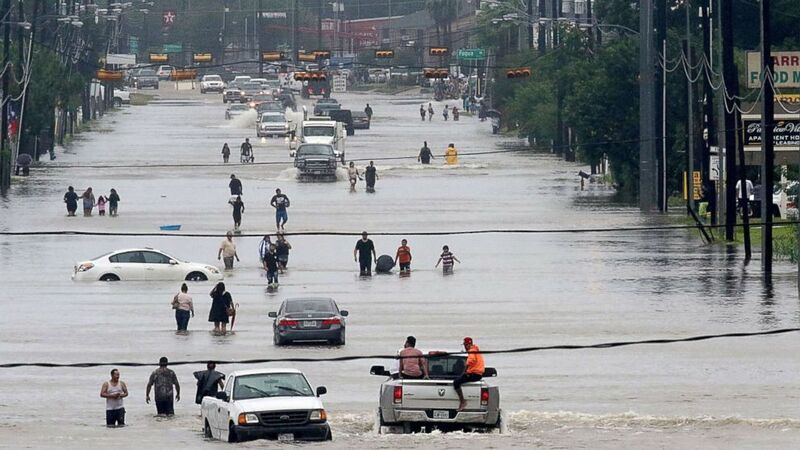 in Houston on Aug. 27, 2017, as the city battles with tropical storm Harvey and resulting floods. Whether policy moves quickly or slowly, the good news, Jacobs said, is the report will remain the most dominant, comprehensive source on the effects of climate change on the U.S. until the next one is released. "It's got a long lifetime. It's going to have a great deal of value over the next four years," Jacobs said. Despite the stark and depressing reality of the findings, Jacobs and other authors were optimistic in a uniquely scientific way: the report, which they've worked on for years, is now open for business. "I was incredibly happy that it was being released," Jacobs said. She looks forward to talking to communities, stakeholders and congressional staffers, she said. "We're jumping up and down for joy to present the latest findings," Ekwurzel said, which are out in time for the 24th Conference of the Parties, a United Nations conference that begins next week in Poland and will focus on full implementation of the Paris Agreement. Ekwurzel described the early release date as "sort of like being a homeowner and the contractors came in early." And she hasn't given up on Congress, despite gridlocks over the issue in the past. "I am concerned but I'm also starting to see a new urgency within Congress. People are realizing that it makes economic sense," she said. "The atmosphere is non-partisan," Ekwurzel said. "It doesn't matter whatever political persuasion. This truly is a nonpartisan issue and we have to come together and do what's best for keeping people safe in the U.S. and having ways of powering our economy." The focus now should not be on the past, but on how to prepare for the projections, authors said. "Frankly, I think it gets harder to argue that the science regarding climate change and the damage to the U.S. from climate change impacts is something you can continue to ignore," she said. "We have to figure out solutions." Chinowsky, Ekwurzel and other authors emphasized that they were pleasantly surprised the administration allowed them to publish their findings without any editing or interference -- though Chinowsky said the holiday release date, which he called "a very intentional attempt to bury the report," shed light on the hands-off approach: "Now we know a little bit more why they took a different strategy," Chinowsky said. In politics, big news on Friday afternoon is often referred to as a "Friday news dump," and this one came on a day most Americans are shopping and eating Thanksgiving leftovers. But while the release date might have affected how many average Americans read the report, industries and communities that need it will still hear the results loud and clear, said Jacobs. "It remains to be seen to what extent the findings are undermined," Jacobs said. "From where I sit and what I see in the communities and the states, the train has already left the station. People know they need this information. They're seeking it out and using it to make their communities stronger and more resilient," she said.